2. Author Signings and Celebration… come ye all! 3. Pitch your local Weekly ... #1 way to get publicity—love this! 4. Meet you Community … tell us about you! 8. Question of the Week … how do I start my book? 9. Book Shepherd "Fun" of the Week … see the impossible become possible! Loved last Saturday in my living room: the Book Publishing Roost where 24 authors at all stages gathered for three plus hours to brainstorming, asking questions, getting answers about authoring, books, publishing, and writing. A grand morning that is held once a month for locals. Big parties are over (two of them with over 40 for dinner at each), now for several small get-togethers with friends; my new glasses are in; presents all wrapped and those that needed to be sent have left; a new watch band rests on my wrist for my favorite watch—Tigger—always reminding me that joy can surround me if I choose; and I’m looking forward to a "girls" weekend in Arizona in a few days—fun, movies, cooking together, and just a few hours—Tigger goes too! ALERT: So many tell me that they NEVER get info from us for months—meaning no blogs, ezine, announcements—literally zip. Make sure that you have Judith@Briles.com and Office@AuthorU.org in your address book and clear them as GOOD emails to receive info. Did you grab your copy yet? This is a HUGE GIFT to YOU … The audiobook version of my latest, How to Create a $1,000,000 Speech is ready for your listening and learning pleasure. AND—in #2 below—use this link to get your free version. My gift to you during this holiday season. And a heads up—hold the FIRST Saturday of the month—programs are planned for authors who desire to be seriously successful in Colorado. Mara Purl and I will kick off the new year on January 5th—How to create stellar book and author events, celebrations, and "oh so noticed"! Get registered … details below. Join many of our authors – on Wednesday, December 19th … get their books … in fact, buy ANY book in the Colorado Blvd Barnes & Noble and support the about to birth Colorado Authors Hall of Fame! All Day and Evening on December 19th will be big – it’s the Colorado Authors Hall of Fame Day at the Colorado Blvd. Barnes & Noble. Author signings all day … all customers who use the special coupon created by B&N and distributed to ANYONE who comes into the store on December 19th, selects books AND then gives to the cashier at check-out will create a donation back to the Authors Hall of Fame gratis B&N … how very cool is that! BRING your friends and support those who are signing and SHOP, SHOP, SHOP in the store. We will get credit for any books as long as a coupon is given to the cashier. Oh … this is so hot! 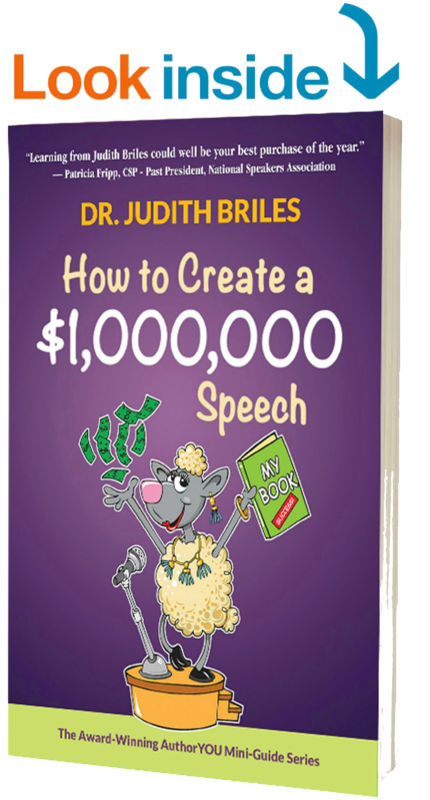 BONUS: It starts when the store opens … and JOIN Judith Briles for her official Colorado launching of the already bestselling book, How to Create a $1,000,000 Speech at 6 PM. January is author and book celebration month! At least that's what the AuthorYOU community is declaring, and at our January 5th meeting, you'll learn how to market your books through events and awards. We will show you how to create an event that venues will welcome and buzz about and probe into the book award world. 1. Book Awards– what to know; which ones to go for; when to pay; what to do when you are a winner. 2. Creating non-bookstore events– get ready for ideas galore—from galleries to restaurants to retail stores … yup, even Costco and Sams. You want to be there— for newbie authors and multi-published ones. It’s a celebration of you and your words. And what to do forward. The #1 Way to Get Publicity … and it’s FREE! One of the best ways to generate publicity for your business is to pitch your local weekly newspaper. Local news is a weekly's bread and butter because most editors don't buy a national wire service like The Associated Press. If they sell a lot of ads during a certain week, they need a mountain of local news to fill the pages. Did your weekly already write about you? Pitch again! That's what Kasia McDaniel of Southern Pines, N.C., does. She's a home decorating and staging expert who has pitched her local bi-weekly newspaper seven times in the last few years. Each time, she got publicity. Because she’s an active volunteer, she also found her way onto the websites of nonprofits and into their newsletters too. All those media hits helped brand her as the local decorating and home staging expert. They made the phone ring and attracted new clients. Meet the Author YOU Community … let’s hear about you! Each week, let’s meet members of Author YOU… here’s what I want you to do. Send me info on you (approximately 70 words—who you are, expert in …, a tidbit about what you do, connection to your website, a photo of you). Send it to me at Judith@briles.com AND put in subject line member: info for ezine. Love doing this … but no one sent anything this week … let's get your info and shoutouts in! WEBINARS – 2019 … #1 will focus on your next book (or your first) … but awesome tips for betting it done FAST … as in a flash. Why not plan on another book this year … before summer? Why not indeed! You know, in that moment, you should write it down. • "What was that brilliant idea I had at Costco the other day?" • "I know I wrote it down, but WHERE?" • "They had COCKTAIL NAPKINS and PENS for crying out loud... why didn't I use them?!?" NO MORE after this all-new webinar with Dan Janal, creator of PR Leads and on the original marketing team that brought us all, "You've Got Mail" ... Your next book ... blog ... your whatever will be doing a happy dance after this hour. After registering, you will receive a confirmation email containing information about joining the webinar. And YES, it will be recorded. Make sure you register so that you get it. When is the last time you did a checkup on your website? Why not now. Try Nibbler –it’s free for a quick analysis of how long it takes to load your site and much more. Takes a few minutes for the assessment and you get a written report. A good thing. November 14 -- this is the webinar you do not want to miss—no slides, just a deep dive through Karen Liz Albert’s desktop into the platforms of Facebook, LinkedIn and Instagram. I guarantee you will learn things that you didn’t know exist! Rarely can I say … a webinar is an Author Strategy Game Changer. Last month, I showed you one on how to goose your PowerPoint slides to stellar display. The Author 30-Day Social Media Facelift now joins the ranks of must watch and do. 4. Oh, you can "listen" to 95% of webinars … this was one that you were glued to what was unfolding on your screen. Yup, a true Game Changer. For influencing. For Marketing. For Author Success. Question: How do I start in writing a book that is nonfiction? Answer: Start with your idea … what is it? Next, I would get a 31-day flexible file—have labels. Whatever your separate thoughts and ideas are –that is a label. Always have "other" … now start collecting –physically. Print out what you have collected in items, files, etc. Drop them into the file slot. This is your research time—gather, gather, gather. As you do, you will notice that some areas "fatten up"—those will most likely become chapters. If you are doing interviews—they may land in several chapters—copy/highlight and drop in. Scan your labels—note what is surfacing—some areas you knew with essential; others may be surprised that bubbled up with your research. When you are ready to actually start writing—just pull out my section at a time—otherwise, confusion can hit when there is too much on the plate. Your writing begins. It’s how I’ve done 36 books. Love it when I find a fun shorty—a quick smile, a laugh out loud, a sip of tea … and back to work—perfect. These are unbelievable … you will be surprised that the impossible becomes possible!